My training has not gone well after CIM, too short for a full training cycle and too long to treat it as a back to back race. The changes of race and travel plan has topped unnecessary pressure as well, and I am relying on will power to carry through this training cycle which has been more difficult than the running parts! I will honestly admit that I haven’t put my heart into this training 100%, and that’s just bad!! We all know mental plays a big part in preparing for a marathon race! My left ITB and knee have been bugging me for two weeks now, and I suspected the cold weather has a lot to do with it. Though I have researched about how to train in winter, and I actually had trained through winter last year when preparing for the same Tokyo Marathon. But this time I have run more races in the cold than last winter, the CIM and New Year’s One Day 6H Endurance Race have me well spent. 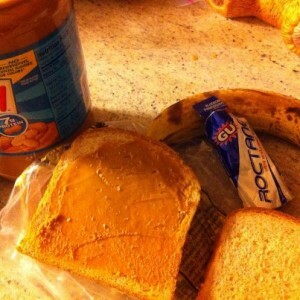 Sunday Feb 3rd, after my simple race day fuel — banana and peanut butter sandwich which I started to like after several trail races, I met up with Max and his friend Loius at 6:30am and I offered them my GU Gels and GU Chomps as we heading to Golden Gate Park. Max drove like a race car driver as usual, and our ride was pretty quiet since we were all half awake I guess. Took a while to find parking spot and we had about 20 minutes or so to race start. I lost Max in the crowds right away, but assumed he must have gone to the front joining the fast runners. I stick with Max’s friend Louis and Julien, but very soon I lost them both as soon as the race started, but I think I wasn’t too far behind them the whole time. 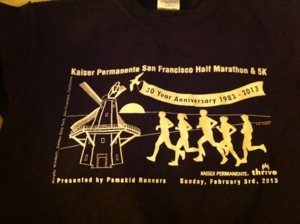 I have run inside of Golden Gate Park several times at different races, but somehow it’s not the same as I remembered?! The year that I ran Kaiser I got injured from stepping onto potholes, so this time I deliberately ran slower to avoid any possible accidents for I am too close to Tokyo Marathon now. Hence my goal for today isn’t PR, just wanted to run a long run and be here to support Max. I started slowly at 10:00 pace for the first mile, and tried to keep it around 9:30 pace all the way. It’s very cloudy in S.F. today, so when I came to mile 7 1/2, the ocean view wasn’t as amazing as I remembered it used be. From mile 7 to 9 was one long stretch and quite boring, and I discovered that there was no gel at all. I took a packet of GU Roctane at the Start and thinking there would be something similar at aid-stations and I did not have to carry anything with me — huge mistake. And the orange color Gatorade tasted very nasty that I did not touch it again. Supposedly I should not overlook the importance of race day nutrition, so I think I have gotten too confident about what I can do. 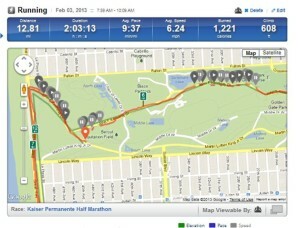 At mile 8, I really wished I had my own GU Gel and GU Brew. 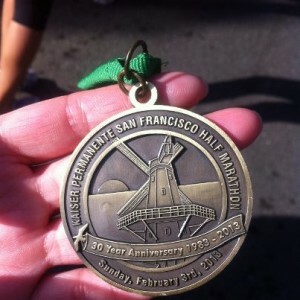 Around mile 10 the tendons at the back of my knees started to hurt and alarm went off in my head, so I told myself “don’t push it,” PR at Kaiser is not worth the risk of jeopardizing Tokyo Marathon. I slowed down my pace by 10 secs or so, and just wanted to finish the race. Turning right on JFK Drive into the other end of Golden Gate Park, I knew the finish should be right ahead though I could not see it. I resisted the urge of sprinting at the end and safely crossed the finish line. On our way back to Sunnyvale, I looked up race result for Max and holly smoke he did 1:29. He questioned “what’s the second?” Aha… the ever over-achiever!! He told us that he actually thought about pushing it at the end, but decided not to. Good for him!! I am glad that he ran it with clear head and made the right judgement call; the last thing he needs now is to prolong the injury. With his great race result, suddenly I didn’t feel too sucked about my 2:03 time anymore. 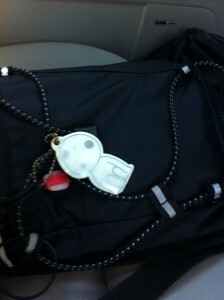 Looking at the hydration backpack with that Kodama lucky charm, I sure hope it does bring good luck to my friend. Knowing his doing well is always important to me, and the thought of he is almost coming out of the tunnel of injury makes me so happy. Probably happier than himself?